How’s everyone? Finally you’re hearing from me again.. I know.. I’ve been busy this few weeks T_T BUT! I can sense weekend coming!!!! For almost a decade, Bio-essence has always been on the forefront of innovation to develop effective new products catering to the needs of the consumers and offering a variety of highly popular products to help women and men achieve and maintain gorgeous, healthy skin. Today, Bio-essence with more than 100 products under the brand, including popular ranges like the Shape V Face series (Anti-aging), Tanaka White series (Whitening), 24K Bio-Gold with Bird’s Nest series (Eye, face and neck care) , HydraSpa series (Hydration) as well as Celebrity’s Choice series (Body care) and Nugeno series (Men skin care) out of which many has clinched awards from retailers like Watsons, Guardian and Giant for best selling and most wanted items under facial, eye and body care; Numerous awards were presented by female magazines including Herworld, Female, CLEO, Singapore Women’s Weekly for outstanding performances in product efficacies as reviewed and voted by the editors and readers over the years. Some top selling products include the Bio-essence Face Lifting Cream (Over one million bottles sold and ranking No.1 Sales for individual performing SKU for 7 consecutive years from 2004-2010), Radiant Youth Essence and Deep Exfoliating Gel. Bio-essence is also the brand synonymous with open and public mega challenges to prove its advertising claims. It has held more than 10 public challenge events across Asia each involving more than a hundred people. Consumers were able to instantly see, measure and prove the efficacies of the Bio-essence products through photographs on the spot. This unique formulation is enriched with 2 types of Hyaluronic acid (Power Nano Hyaluronic Acid & Hyaluronic Acid), Cranberry Extract & Bio Energy Fluid, which not only provides long lasting hydration but also protects skin from environmental factors. Bio-essence Aqua Droplet Sleeping Beauty Mask replenishes moisture level, nourishes and repairs your skin non-stop while you sleep. Upon application, hydrating ingredients magically transform into big aqua droplets which are rapidly absorbed to constantly replenish and lock in moisture. This lightweight formula wraps the skin with a comfortable hydrating protective layer without leaving a greasy and sticky feel. Say goodbye to dull and tired skin for a smooth, radiant and supple skin the next morning. keeping the skin moist and soft. improving skin elasticity and suppleness. Works as a great moisturizer and aids in moisture retention, improving skin elasticity and suppleness.It also provides excellent conditioning of the skin for a healthy glow. With Bio Energy Fluid which further nourishes and refines skin texture. Not forgetting, Cranberry Extract is rich in anti-oxidants which protects skin against harmful free radicals, environmental and UV damage. 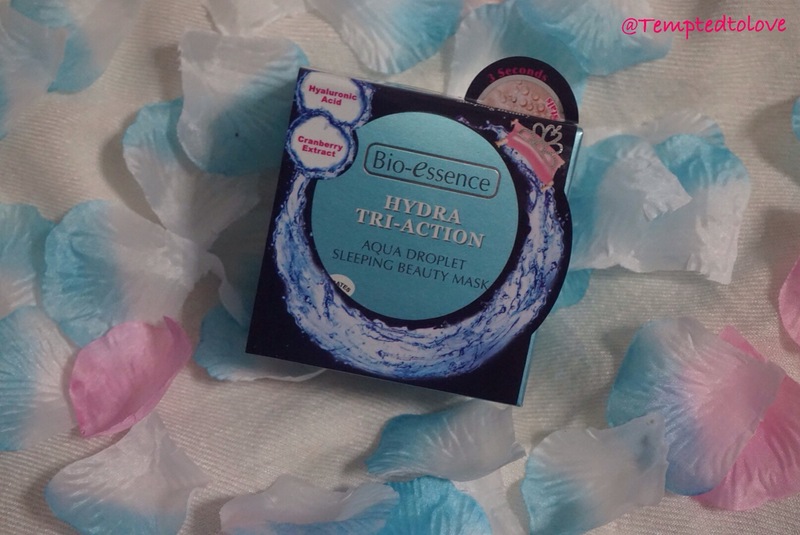 Bio-essence Aqua Droplet Sleeping Beauty Mask is made with their unique Bio Aqua Crystal Technology. This technology forms a protective shield over the hydrating ingredients to prevent moisture loss before application. Upon application, this shield breaks away and big aqua droplets are formed. This ensures our skin gets hydrated with the freshest and most optimal amount of hydrating activity. The big aqua droplets are made up of superior hydrating ingredients of small molecular sizes which allow moisture and nutrients to be easily delivered to the deepest layers of skin, while the protective emollient film remains on the skin to lock in moisture for non-stop hydration. This is actually my second time using this mask! Still remember the first time when I’m introduced this sleeping mask, I’m totally blown off!! It’s so amazing seeing the gel becomes water droplet!!! I actually apply it again and again just to see it transform! LOL.. This is definitely a fun way to keep your skin hydrated and nourished! 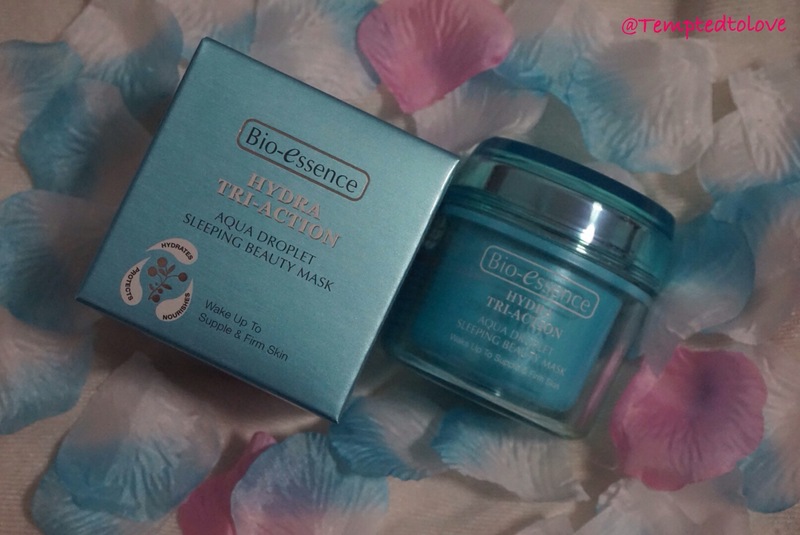 This entry was posted in Bio-essense and tagged face mask, Sleeping mask by Tempted to Love. Bookmark the permalink.